On Friday, September 15, 2017, the Cassini mission will come to an end. This has been one of the most successful space exploration ventures of all time. It launched in 1997 and took nearly seven years to get to Saturn. It entered orbit around the ringed world in 2004, and, well, everything we knew about Saturn changed. Everything. We watched as storms erupted in the planet’s atmosphere, as aurorae crackled above it, as moons shifted and passed each other and flew close and far. And the rings. Dear sweet heavens above, those rings. I’ll take this week to collect my thoughts on this wondrous mission and write them down for Friday. But until then, I want to share with you some of my favorite images and animations from Cassini, taken over the more than dozen years it’s orbited Saturn. Stress on the word some. I started taking notes and had to stop myself when I got to 30 such examples, and wound up having to cut many of them out, lest this article use up all the electrons on the Internet. So I had to skip Iapetus, and Prometheus pulling tendrils from the rings, and Titan flashing us, and the G ring, and and and. If you have to ask what Cassini means to humanity, then perhaps all you need for an answer is that it is literally impossible to choose the best works of art it returned to us from over a billion kilometers away. There are simply too many. Hundreds. More. Scientists will be writing papers about the data for decades, at least. People will be gawking at the images for far longer. This mission is a triumph of science and engineering and humanity and the human capacity to wonder and to find out. It’s the best of us. And so here is a small sampling of the best of it. Enjoy. 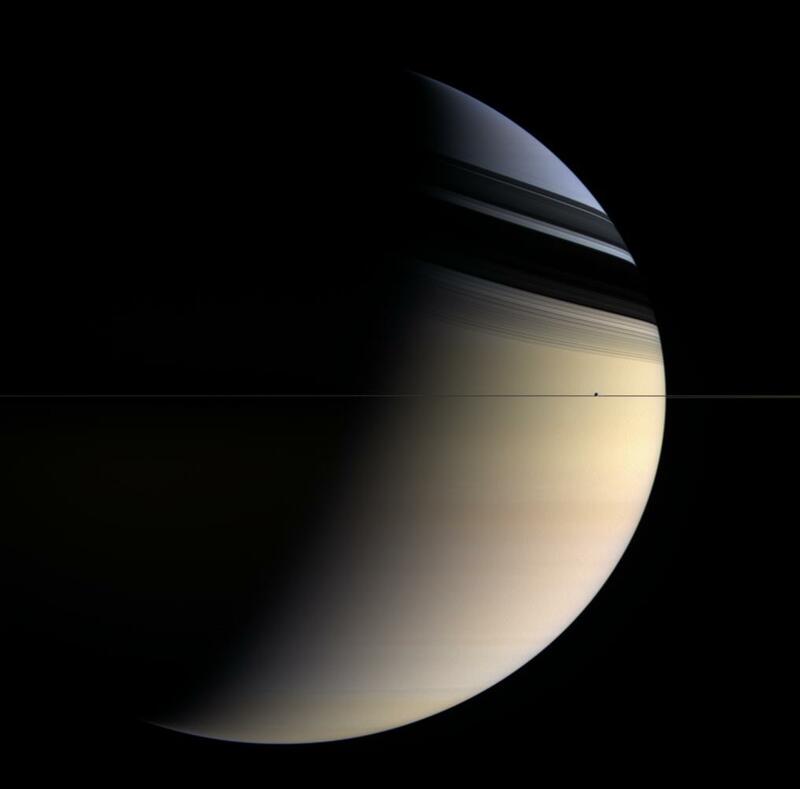 This may be my very favorite image of Saturn ever taken, on Earth or from the heavens. This ridiculously spectacular view looks down from high above the ringed planet, and is composed of 36 separate images (a dozen each in red, blue, and green filters) taken in 2013. Croatian software developer Gordan Ugarkovic carefully processed and assembled the images to create this jaw-dropping portrait. The detail in it is incredible; you very much want to peruse the original 4000 x 3200 version, unless staggering beauty is something you hate. This shot of Saturn looks a lot like the one just above, doesn’t it? But look again. In this mosaic, created by image processor Ian Regan, the terminator (the line between day and night) crosses much farther from the north pole than in Ugarkovic’s mosaic (in Regan’s shot, the entire dark band around the north polar hexagon is visible, and note how much shorter the planet’s shadow on the rings is in Regan’s image). That means Saturn’s north pole was tipped more toward the Sun, which in turn means it was closer to the summer solstice when Regan’s images were taken by Cassini. And, sure enough, this image is from 2016, while Ugarkovic’s was taken in 2013. Saturn reached northern hemisphere summer solstice in May 2017. Don’t get me wrong: Saturn’s an interesting planet all by itself. But it’s the rings that set it apart from all the other planets (Jupiter, Uranus, and Neptune have rings, too, but not nearly as gaudy and spectacular). This image, created from 45 shots (15 each in the red, green, and blue filter to approximate natural color), was taken in 2007 from over a million kilometers from Saturn. It’s labeled so you can see what’s what. The rings are divided into major groups by letter (in order of discovery: D is closer to Saturn but was seen much later than the brighter and broader A and B rings), and there are also gaps carved out by the gravity of moons. The Cassini Division is the most obvious through a telescope, but the Encke and Keeler Gaps are commonly seen in Cassini spacecraft shots. The rings are very thin (see “Thinner than paper” below) and composed of countless particles of ice, the biggest of which are maybe 10 meters across. That’s small, given that the rings themselves are 300,000 km across, ¾ the distance from the Earth to the Moon. Like a permanent hurricane, a swirling vortex sits centered directly over Saturn’s north pole. This enhanced color view (it’s not really red, it’s just displayed that way to make details clear) shows it to have a lot of three-dimensional structure, with whorls and vortices inside it. The whole complex is about 2000 km across, and winds rage inside at 330 kph, the equivalent of a Category 5 hurricane. In this enhanced color shot, a weird hexagon-shaped wind system blows around Saturn’s north pole. At 20,000 kilometers across — wider than Earth! — it’s huge (the smaller vortex shown above can be seen at its center), and as unnatural as it looks, it really is just the natural consequence of winds blowing on a rapidly rotating gaseous planet. Many planets show such geometric patterns in polar air flow. You can also see Saturn’s rings (remember, this is an enhanced color image, so they aren’t really that eerie blue) beyond the planet’s edge. In December, 2010, Cassini images revealed a bright spot in Saturn’s northern hemisphere. It grew in size and brightness at an astonishing rate, a tremendous storm of upwelling material that got whipped around by the planet’s fierce winds. Shocking planetary scientists, within two months the storm had wrapped itself all around the planet, overlapping itself. At its peak, it was over 300,000 long — enough to reach ¾ of the way from Earth to the Moon! It persisted for nine months before finally fading from view. In this image the rings are edge-on and hard to see, but their shadow is cast obliquely on Saturn’s cloud tops. In 2004, scientists noticed some odd features in a gap in Saturn’s rings. There were ripples and waves in them, and they suspected a tiny moon’s gravity was pulling on the particles there. The next year, they discovered that moon, and named it Daphnis. It’s only 8 km wide, roughly the same size as Mt. Everest. Its gravity is feeble, yet it’s enough to carve these lovely and graceful scallops in the rings. The orbit of Daphnis is ever so slightly elliptical, so when it dips nearer the ring gap edge it pulls harder there, lifting the particles away from their usual orbit. Imagine it oscillating a little bit up and down in this image, tugging on one edge and then the other, and you’ll get a feel for the process involved. In early August 2009 Saturn reached equinox: the point in its orbit when the Sun would be over its equator all day long. Why is that interesting? Because the rings are also over the planet’s equator, so the Sun was shining on them exactly edge-on. Usually the Sun shines down (or up, if you think of north as up) on them, but at the equinox, they are illuminated from the side, so they are essentially in shadow. This makes them far fainter, and also means their shadow on the planet is the thinnest of knife edges. That’s why I love this image so; instead of shining gloriously, the rings take on a more subdued, moody look. You can see several moons here, too, including Janus (left), Prometheus (middle), and Pandora and Atlas (just inside and outside the thin F ring on the right, respectively). This image is gorgeous — duh — but it’s also terrifically confusing. 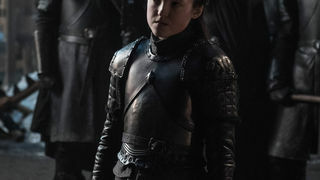 What are we seeing here? OK, first, on the right you’re seeing the rings light by the Sun. We’re looking up, toward the north, at the underside of the rings lit from above (this perspective makes them look a bit darker than if viewed from the top looking down). The dark swath across them is the shadow of Saturn cast on the rings, darkening them. On the left is Saturn itself … but there’s more. First, you can see the rings in silhouette across the face of the planet; they’re between us and Saturn in this view. Not only that, but this is the night side of Saturn we’re seeing here, and the only reason you can see it at all is that it’s lit dimly by sunlight reflected off the rings! So the sunlight reflected by the rings onto the surface of Saturn is blocked by the rings themselves, which are in shadow. Got it? (This image might help too.) Yikes. 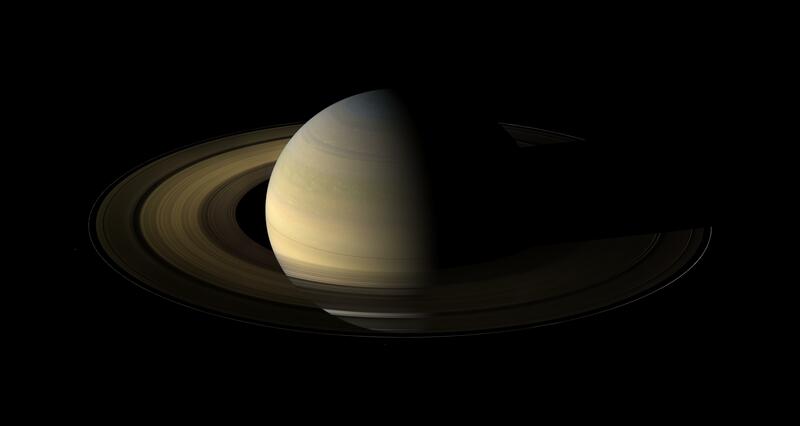 Saturn is incredibly beautiful, but sometimes a head-scratcher to figure out. Saturn has a lot of weird little moons. A lot. The tiny chunk of rock and ice named Helene is one of them. It’s only about 44 km long across its widest dimension, and, honestly, not a whole lot is known about it. Cassini only got close a handful of times, but what it saw was intriguing. Helene is too small to be round; its feeble gravity can’t make the material inside it flow enough to form a sphere. But the gravity is strong enough to make material on the surface flow; images show clear flow lines as material moved around. It also has a smooth appearance, likely due to being covered in dust (which flows well, so that’s consistent). Something I didn’t know until I wrote this article: Helene orbits Saturn 60° ahead of the much larger moon Dione, meaning it’s a “Trojan” moon, located in a stable gravitational point in the same orbit. How appropriate, a moon named Helene that’s a Trojan! Also, I wasn’t aware Saturn had anything like this; even at this late stage of the Cassini mission, it’s still teaching me things. Here’s another brain-bending shot. The geometry here is great: This was taken in 2004, when it was winter in the northern hemisphere of Saturn. That means the sunlight is coming from below, and the rings look bright due to reflected sunlight, appearing somewhat tan in color. They’re casting their shadow across the northern hemisphere of the planet, which explains the dark bands. But why is Saturn blue? This is actually real! Saturn’s upper atmosphere is usually hazy, making it look yellowish, but that winter the air there was clearer. The hydrogen gas in the air preferentially sends blue light back up toward space more than red light, so the planet looks blue. Bonus: The icy Death Star moon Mimas is seen half lit, hanging superposed on a bright blue swath of Saturn from sunlight streaming through the Cassini Division in the rings. That’s no moon… oh wait. Yes it is. Wait, did I say Death Star moon? Yeah, it’s pretty easy to see why Mimas is called that. This icy moon is a noticeably egg-shaped 400 km across, covered in small craters from countless impacts over its history. But one impact was a bit more intense … that crater is called Herschel (named after the moon’s discoverer, William Herschel), and it’s a whopping 130 km across! Whatever hit the moon to form that crater was big and moving fast; had it been a bit bigger or faster, it might have disrupted the moon, literally shattering it. We actually see craters this size on several moons in the solar system, making me wonder how many more moons have been destroyed by impacts. And don’t miss the irony: The Death Star destroys planets, but the Death Star moon was nearly destroyed itself by a smaller moon. There must be some sort of moral lesson here. Probably something about the force of impact, or impact of the Force. Did I mention Saturn has a lot of weird little moons? It’s not a contest, but if it were, Pan (left) and Atlas (right) would be way up there on the “weird” list. Pan is about 35 km across, and Atlas slightly larger at 40. So why are they shaped like, well, flying saucers? Pan orbits just inside the outer edge of Saturn’s A ring, the brightest group of rings. Atlas orbits just outside the A ring. Because of this, they probably accumulate material from the rings due to gravity (weak as it is on both moons). Because they orbit in the ring plane, and the rings are incredibly thin, the material piles up on the equators of the moons. The weak gravity means the material can really pile up high, though Pan shows clear evidence of the material slumping, just as a big pile of snow would on Earth. Atlas has that too, but the material looks softer there, fuzzier, so it’s harder to see. One thing I don’t think a lot of people really get about Saturn is just how thin the rings are compared to their width. Despite being about 300,000 kilometers across, at their thickest they’re only about 1 kilometer top to bottom at most! That’s a ratio of 0.0000033. For comparison, standard writing paper is about 28 cm long, and 0.1 mm thick. That’s a ratio of 0.00036. So scaled to the same size, paper would be 100 times thicker than Saturn’s rings! The reason Saturn’s rings are so astonishingly thin is that they’re made of trillions upon trillion of ice particles. As they collide, they steal each other’s angular momentum, which tends to drop them all into the same plane. Collisions are so frequent that this process is incredibly efficient, shaving the rings down into their wafer-thin dimensions. In this image (taken in 2006) you can see this, as well as the moon Enceladus (note the blue tint to Saturn’s atmosphere, explained above in the section “Blue Saturn”). Radial patterns called spokes move across Saturn's rings in animations made from Cassini spacecraft images over five different time periods. Discovered in Voyager images from the 1980s, it's not precisely known what they are, but they're likely made of dust particles suspended over the rings by electrostatic forces (maybe generated by teeny micrometeorite collisions with the ice particles in the rings). They move around Saturn much faster than the ring particles, in fact at the same speed as Saturn's magnetic field rotates, making it clear they're connected (magnetic fields can accelerate charged particles like dust). 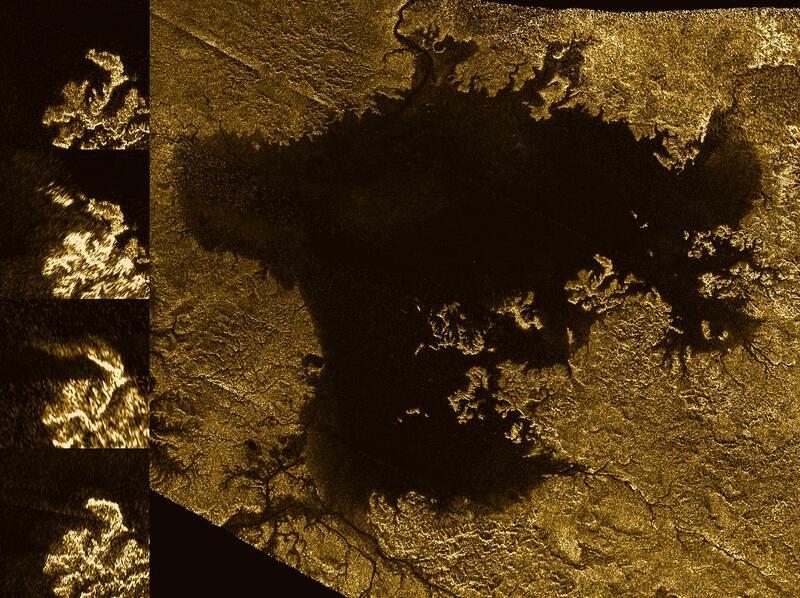 One of the biggest discoveries of Huygens — of the entire Cassini mission — was the existence of liquid lakes on Titan’s surface. But they’re not water: They’re methane and ethane! Those are what we’d call natural gas here on our much warmer Earth. In fact, there’s evidence that Titan has a methane cycle much like our water cycle here. Cassini (using haze-penetrating radar mapping) also found dunes of hydrocarbon sands, winds blowing around Titan, and evidence that carbon-based molecules may rain down to the surface. Is there prebiotic chemistry going on at Titan? Perhaps our next mission there will reveal that. Orbiting nearly 1.5 million kilometers out from Saturn, Hyperion is one of its oddest moons. It has an extremely low density, even lower than ice. It is likely a rubble pile, a collection of loosely bound fragments held together by their own gravity. This may have been caused by repeated collisions with other objects over the eons, shattering it in place. When you look at it, that’s totally believable. It looks like Styrofoam! It’s covered in craters, and many of them have very dark material on their floors. This may be darker material flung into space by impacts with Phoebe, a smaller but much darker moon. At 360 km across its longest dimension, Hyperion’s one of the largest objects in the solar system that hasn’t crushed itself into at least a rough sphere by its own gravity. Saturn has so many moons that some are bound to be more interesting, more exciting than others. It’s an unassuming thing at first glance. An iceball 500 km across — roughly the width of my home state of Colorado — it looks like any other airless body out there. Shiny, round, covered in craters. The usual. But then, a lot of it is covered with odd, long, linear features that look very much like ice floes. We’ve seen that on Jupiter’s moon Europa, and we know there’s liquid water inside there. Could Enceladus have it as well …? And then, one day, Cassini flew past that little moon and saw it backlit by the Sun. The images it returned are, well, magic. In this long exposure, the stars in the background are streaked, and the sunlit crescent of Enceladus is overexposed. But see those plumes on the left, seemingly erupting like geysers from the surface? Yeah. Those are the plumes of geysers erupting from the surface. This may be the most significant discovery of all the Cassini mission! Those are water jets, literal geysers of water, blasting out from cracks in the surface of the moon. This is a clear indication that the interior of Enceladus is liquid, heated by tidal forces as the immense gravity of Saturn alternately squeezes and stretches the little moon as it orbits the planet on a very slightly elliptical path. Over 100 such geysers have now been mapped on Enceladus, and at one point, Cassini actually flew through them, collecting samples to analyze. It found that the geysers are indeed water, but also have dust grains with simple organic (carbon based) compounds in them. Now do you see why this is such big news? It means the conditions for life may exist under the surface of that little moon! We knew that such conditions might exist inside Jupiter’s moon, Europa, but Enceladus is smaller (so more unexpected that it would have water), and the evidence for liquid water is more direct. We don’t know if life exists under the ice shell covering Enceladus, but for my money, it’s the place in the solar system we’re most likely to find it outside Earth. It also opened the door wide to look for signs of liquid water in other places. Saturn’s moon Dione may have an undersurface ocean, and even frigid Pluto might as well. The idea that you need to be close enough to a star to have water and life went right out the window with the discovery of these plumes. An icy moon and a big planet work pretty well, too. Enceladus taught us an important lesson: We needn’t be so provincial with where we look for water, and for life. And it also showed us that taking a long, closer look at everything around us will yield surprises, things we hadn’t hoped to dream. That’s a lesson I’m very happy to learn. As I said above, the rings are incredibly flat. Usually. In the image above, taken just a week before equinox, you can see the rings are actually wavy, rippled, with excursions going up and down by quite some ways (several hundred meters in fact). What’s causing that? In the middle of the image, the tiny moon Pan is carving those waves inside the Encke gap. Its orbit is ever so slightly tipped with respect to the rings, so it bobs up and down with respect to them. As it does, it pulls the nearby particles with it, creating those ripples. To the left, the even smaller moon Daphnis does the same thing inside the narrower Keeler gap. These waves are there all the time but most visible when the Sun is “low”, shining edge-on to the rings. That way, vertical structures like these waves cast long shadows, making them easier to spot. Let me leave you with one shot, one perfect shot, what may be simply the most magnificent and profound image of a planet ever taken. On July 19, 2013, Cassini was on the far side of Saturn from the Sun and Earth, near the apex of a particularly distant orbit. As it fell into the shadow of the mighty planet, it started taking images. One after another, it took over 300 images using both its narrow- and wide-angle cameras, scanning over Saturn to include not just the planet but also the rings, including the faint, outer, fuzzy E ring (created from ice particles erupted from the south pole geysers at Enceladus). In this mosaic created by those images, the rings and planet are backlit, with a ring of scattered light creating a narrow halo around the edge of the planet itself. Spectacular as this is — and it is — there is a treasure hidden away, tucked under the rings. You can see numerous moons and even background stars in this mosaic, but to the right of Saturn and below the rings is a particularly bright star. In fact, when you zoom in you see that it’s not one but two stars … and they aren’t stars. Those are the Earth and the Moon. From 1.4 billion kilometers distant, the Cassini spacecraft could see the world from which it was first sent. Just a spark, there in the background, nonchalantly hanging among the other background specks of light. But that small dot is our home, where humanity was born and where we all are still residing. The farthest any human has ever traveled is just a handful of pixels in this image, the tiniest leap from one stipple to the next. But our robotic proxies, oh, those have journeyed so much farther. From Earth to the Moon, to Venus, to Mars, to Jupiter, past Uranus and Neptune and Pluto ... and one such craft that ventured to a gas giant planet with sprawling rings and a myriad of bizarre and wonderful moons. It came to stay, and stay it did. For more than a dozen years it has faithfully sent back data to the tiny world it left behind, and for decades to come humans will be scrounging through those bits to learn more about this wondrous place, this home for Cassini. And now, with mere days left on this adventure, we can gaze with wistful awe toward that machine, toward Saturn, and give our thanks.